I have seen my friend make this combination and loved it. So I made this for her on her birthday and enjoyed it. It is perfect as an offering to the Lord as well. In a heavy bottomed pan, boil milk and add sago and semiya. Let it come to a boil. [Cooking sago in a pressure cooker is also a great idea]. After the sago has cooked through [it becomes transparent], add sugar and powdered nuts. Let the kheer simmer for a few minutes. Remove from heat and garnish with nuts of your choice. My older one looked this up on one of her social media accounts and thought I would love this mango based froyo [Frozen Yogurt in short], as she says. So instead of she making it for me, she shared the recipe with me and told me that she would make it soon for me. But I was in a hurry to put this post together in time to use for this theme today and so ended up making this before her. Though she didn't like the addition of Greek yogurt in this, the others including me loved this. Blend all the ingredients until smooth. Pour into a freezer safe bowl. Freeze for a few hours. Scoop out the frozen yogurt, sprinkle some chopped nuts and enjoy. This last week of BM #76, I have chosen to post some Mother's day recipes. These cupcakes were baked by my kids. I felt these were one amongst the best gifts I ever got, Mother's day or otherwise! My little one volunteered to be the model for the above picture. In a mixing bowl add in all the wet ingredients (oil, yogurt, orange juice, orange zest, powdered jaggery). Mix until the jaggery is dissolved. In a separate bowl, sift the four, baking powder and baking soda. To the wet ingredients, gradually add the flour and gently mix until well combined. Fold in the chocolate chips. Divide the batter into the lined/greased muffin pan. I filled up the 24 cup mini muffin pan and 8 regular sized muffin pan. Preheat the oven to 350 °F. Place the muffin pans in the oven and bake for 13 minutes and remove the mini muffins. Bake another 5 minutes for the regular muffins. Serve warm or allow them to cool and store them in an air tight container. They were gone in a day. For Week 2 Day 3 of BM #76, these chocolate cupcakes make their way into the picnic hamper. For my little one, the picnic is incomplete without cupcakes. So my picnic hamper this week had Grilled Caprese Sandwich, Jalapeno Bondas and these cupcakes. I have never used coffee in any of the bakes and I used it in these cupcakes. Personally I didn't find any notable difference. In a mixing bowl, beat the wet ingredients (oil, hot coffee, milk, yogurt and sugar). In a different bowl, sieve the flour, baking powder, baking soda and cocoa powder. Gradually add the dry ingredients into the wet ingredients and beat with an electric beater until the batter is smooth and well combined. Don't over mix. After a month long Baking Marathon, I took a much needed break and back to the regular posting schedule. Here I am with a new series this week, 'The Picnic Hamper'. Now that the weather is improving, my little one has started pestering me for Popsicles , ice creams and the like. In no time she will start asking for picnic hampers for her and her friends. I made these sandwiches without any pepper flakes and she loved it. I think it is a great idea for the picnic hamper, is it not? Apply butter to both sides of the bread slices. On two of the slices, arrange the cheese and tomato slices as needed. Sprinkle basil, garlic salt, pepper and red pepper flakes. Top with the plain buttered slice. Heat a grill pan/panini press or sandwich maker. Grill the sandwiches and serve them hot. A fantastic series it was this month and it would not have been possible without the initiation of Srivalli and the support of all my fellow bloggers. How can I forget the unflinching support of my family and neighbors who religiously ate all the baked goods I churned out this month? 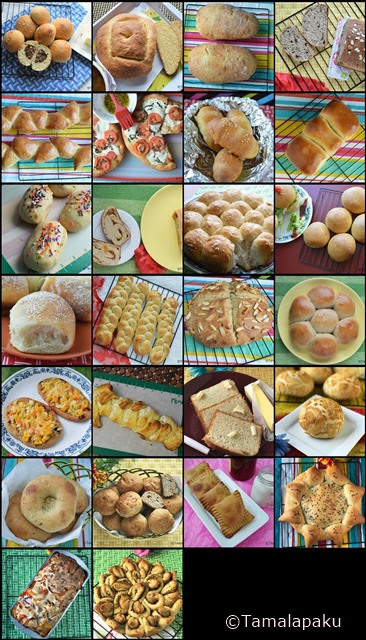 I challenged myself to post only yeast based breads/rolls and it took quite a toll on my time and effort but I enjoyed it every bit! It was also quite a bit of learning and a pleasure to see the magic of yeast unfurl in the oven. As promised here is the recap of the month long A-Z baking series. But before that here are the past Marathons I did with our group.. Check out the Blogging Marathon page for the other Blogging Marathoners doing this BM#75..